There is nothing flashy or glamorous about Civil War Women Blog in its design, but content-wise it is unparalleled. The Civil War period is quite popular right now and there are countless sites dedicated to the topic. Civil War Women Blog offers a niche focus for a broad topic, and one that is highly underrepresented in both scholarly and amateur research. Women were active on both sides of the conflict before, during, and after the upheaval that nearly destroyed the nation. Civil War Women Blog is so drab as to be almost off-putting at first glance. The grey-grey-blue of the design makes the blog appear undeveloped and not worth reading. Whatever it lacks aesthetically is made up for by the content. Maggie MacLean, the site’s author and owner, obviously puts all her effort into her writing. Each post is a short biography of a woman involved in some way with the events of the 1860s. From spies and nurses to politicians’ wives and activists, the women profiled on this site impacted the course of events and shape of the United States in a post-slavery world. While I am impressed with MacLean’s scope and depth of information, I was disappointed by how much of the articles were sketches of husbands. Take Ellen Mary Marcy McClellan for example. It would be crazy to expect no mention of her husband, Union General George B. McClellan, but more than half the article detailed his movements, communications, and actions. There are tons of places to learn about him online and off; I came here to learn about her. I know that society in the 19th century put a lot of restrictions on women and their husbands were the deciding factor for most of the events of their lives, but they were still individuals who acted of their own freewill. They deserve to be remembered for what they did, not what their husbands did. MacLean’s writing is fantastic, far better than average writing online. I didn’t find one spelling or grammar mistake in the 10,000+ words I read closely. As someone who gets quite distracted by misspelling and poor grammar, I can’t express how comforting such careful writing is to me, particularly from a self-described “amateur historian”. For me, Civil War Women Blog offers more than just information and links relating to my topic. It give me something to aspire to for my own writing and content. I would be proud if I produced articles with the same detail, style, and consistency as MacLean does. This blog gives me a goal for my own research, writing, and product that I’ve needed to define. I’ve sent MacLean a message with some questions about her research methods and some content from a few articles, particularly Kate Warne. I’ll let you know if I hear back. The first time I did a big research project was at the end of the last century during my senior year of high school. I wrote 20,000 or so words about the clash between the counterculture and the establishment in the 1960s as exemplified by Hair: The American Tribal Love-Rock Musical. My first task for that project was to get my hands on a copy of the text, obviously. I stomped all over Boston and Cambridge searching though used bookstores for a text that was a little over thirty years old. Someone along that journey, I learned about the rare book site Alibris. It was no help. Today Alibris has thousands of texts listed, including music and movies, but the site had only been around for a few years at the time of my search. Eventually, I found it in a bookshop near Boston’s theater district. 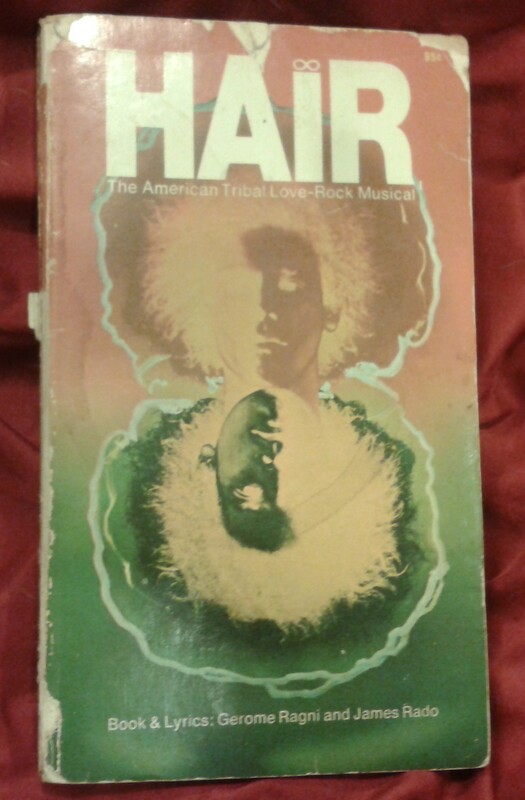 My 1969 copy of Hair: The American Tribal Love-Rock Musical with book and lyrics by Gerome Ragni and James Rado that I bought for my high school senior thesis. I knew from the beginning that my interactions with text from Allan Pinkerton would be different than my high school experience, but I didn’t anticipate how exciting that difference would be. During the last decade of his life, Allan Pinkerton published a number of detective stories loosely based on his experiences and the experiences of his operatives. Published between 1875 and 1884, these books were no longer under copyright so my first reach for them was digitized copies available online for free. Not bad. Easy access and you can’t argue with the price but, while I love the Internet for a lot of reasons, I couldn’t get into reading on the computer. It’s one thing to read a 1000 word blog post, but a 350 page novel. I need a physical book. Next I order some reprints. There are a few companies that scan old text that are in the public domain and sell printings of the scans. I’ve gotten books from 1500 Books and Forgotten Books. Better for me. I have a physical copy I can carry around and mark up to my hearts content. I felt like I had found my way to look at these text. So the next time I had a little money to spend on books, I loaded Amazon.com and started looking for Allan Pinkerton reprints. I put a bunch in my cart but before I checked out I started clicking around the used books section. I had already looked on Alibris and ebay but wasn’t in a position to spend $200 to $500 on a book. On Amazon, however, I found sellers with 1st editions for $30 or less. Why not? The cost was the same as the reprint editions. A few days later and I proudly own a number of 1st editions. Sure, they aren’t in perfect condition. Why would I want them to be? That’s something I’ve never understood about book collectors. 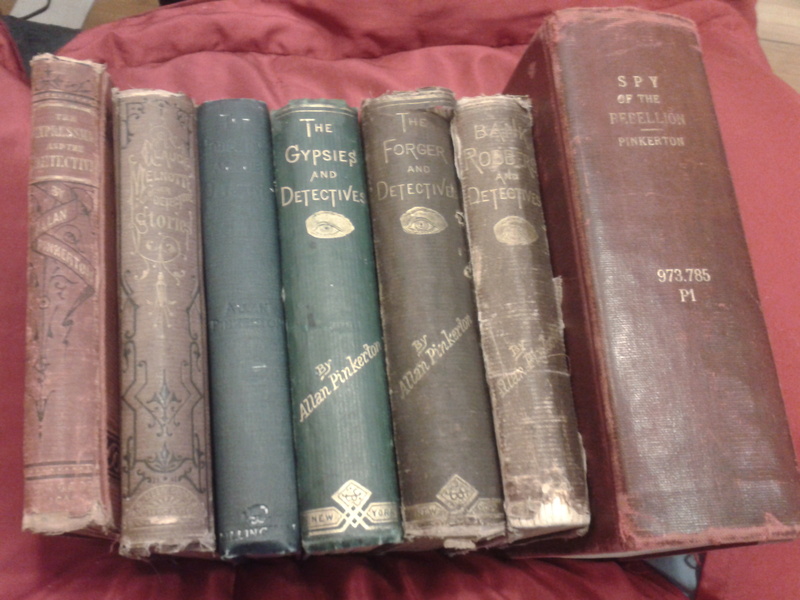 When I hold these books, I can feel the strands of time connecting me to the past, to the people of the 19th century. I love imaging who might have flipped through their pages and where they might have traveled. Because of Amazon, I’ve been able to reach into the past and hold a piece of it in my hands. Who needs a time machine when all it takes is a credit card and Wi-Fi? I’m not a big blog reader. Seeing other people’s productivity makes me feel guilty about not writing frequent, quality blog posts on my own site. Not here, my other blog. Recently, I’ve been looking a lot at blogs that are in some way related to Pinkerton’s. I’m seeking more information about my subject and time period, of course, but also ideas on how to make this blog interesting and dynamic. I thought I’d start writing up a review for these sites so I can remember what I liked and what I didn’t like to reference later, in the event I decide to redesign my site. One of the first sites I explored deeply was The Thrilling Detective, a massive site by Kevin Burton Smith about private eye fiction. It was hard to get into this site at first. The theme is very dark with a ton of banner ads at the bottom. Once you spend a little time looking around, however, you will find a rich website. I guess this is an unexpected benefit of my research; I never would have taken the time to look past the poor organization to find the content. The site claims to focus solely on private detectives but some exceptions are included. The writing is neither remarkable nor offensive poor, putting it well above average for the Internet. I did notice some spelling/grammar errors but not enough to really bother me. There are pages for Allan Pinkerton, Charles Siringo, and Dashiell Hammett. I wish there was more about Pinkerton. He wasn’t just a private eye by profession. He was literally called “The Eye” during his most active detective years. And he was one of the earliest authors of detective mystery novels. The entire scope of this blog originates with Allan Pinkerton and his detective agency. I’ve only scratched the surface of The Thrilling Detective and will certainly spend more time wading through the forest of pages there. The articles are interesting and well organized but Allan Pinkerton’s page contained some inaccuracies and the administrative pages, like the Introduction and FAQs, were kind of snarky. This site offers a good place to fish for ideas but little in the way of actual information. Here is the table of contents from The Pinkertons: The Detective Dynasty That Made History by James D. Horan. One of the earliest scholars to examine the Pinkerton archives donated to the Library of Congress in the 1960s, a number of Horan’s books examine Pinkerton men and Pinkerton activities. Of all the outlines I’ve collected so far, this one is the best. Horan’s break down of the topic is chronological but also thematic. My own outline of the Pinkerton story will likely follow the same time chunks but there are topics I’ll include that Horan did not. Organizing the presentation of such an extensive topic is proving to be quite a challenge. 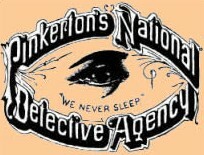 This outline is the table of contents for “The Eye That Never Sleeps”: A History of the PINKERTON National Detective Agency by Frank Morn. The book itself offers more in the bibliography than in the actual text. This outline highlights the major themes of the Agency’s involvement in historical events. I made the following outline while reading an article, From the Pinkertons to the PATRIOT Act: The Trajectory of Political Policing in the United States, 1870 to the Present, by Ward Churchill. The numbered, bold headings are taken directly from the article in the order presented. The lettered subheadings are my own selections of exactly three sub-topics most important from each section. Dillenger, Floyd, etc. = James-Younger, Reno, etc. All of the topics in this outline are important, but others omitted should be added and the order is different than I would have chosen.